One of my students from way back, Liz Chesebrough, makes quilts. 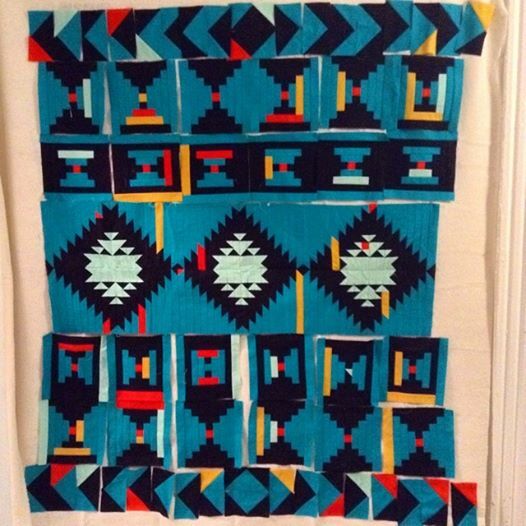 Recently she posted a photograph on Facebook, showing a possible layout for a striking quilt-in-process. The bright colors and hypnotic geometry (inspired by Aztec designs) worked like the magical object in a time travel novel. They took me back–whoosh!–to one of Liz’s Mimi reports, for which she studied Maya hieroglyphs, and made brilliant drawings of some of the glyphs. One way or another, I think regularly about specific reports, and about the ways I saw students grow–by leaps and bounds!–as they explored and wrote and revised and illustrated and summarized. We called them Mimi reports because they sprouted from the inspiration of The Voyage of the Mimi and The Second Voyage of the Mimi. Mimi was a boat, a two-masted 73 foot sailing vessel. The Wikipedia entry now includes a full history of Mimi herself, full of twists and turns, some lucky breaks, and a sad ending. The video stories–fictional, but realistic–followed the expeditions of scientists who chartered Mimi to conduct research. In the first voyage, an oceanographer and a marine biologist travel on Mimi to follow and study humpback whales in the Gulf of Maine. In the second voyage, Captain Granville has come to the Yucatan Peninsula, where archaeologists charter Mimi in order to conduct underwater research into offshore trading routes of the ancient Maya. In both voyages, the captain’s grandson and other young story characters served as our surrogates, and we learned along with them. The young actors also hosted brief documentaries following each story episode, focused on real-life scientists. 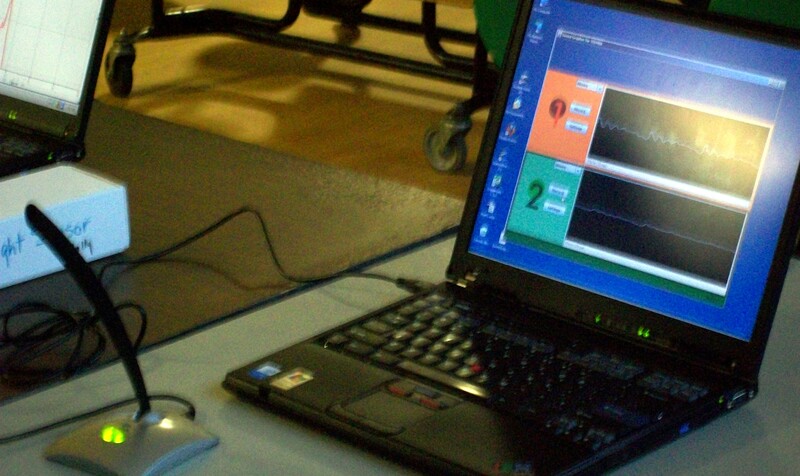 Learning games for the computer, along with a computer laboratory with probes for charting real-time data, expanded the experience even further. Make a web. Put one of the Voyage stories in the middle, with all its fields of science and kinds of scientists radiating out from that. In a third ring you could put the topics of the Mimi reports, jumping out to related or tangent topics–from the ecology of a square yard of pond frontage, or the behavior of river otters, to the recent findings of archaeological investigations at Stonehenge, or the history of humans’ use of fire. You can read about the way we began our report-writing process, using something called a Skimathon, here and here. You can also read about our version of the writing, revising and sharing of long individual reports, and the role of that process in our class life, here. Recently I found some photographs, lucky souvenirs from just one typical, wonderful year, and that’s what I want to share in this post. Most were taken at Mimi Night, the special evening celebration for which we invited families and close friends. For this round, in the spring of 2010, we had been following the first Voyage, focused on the bodies and behaviors of humpback whales. 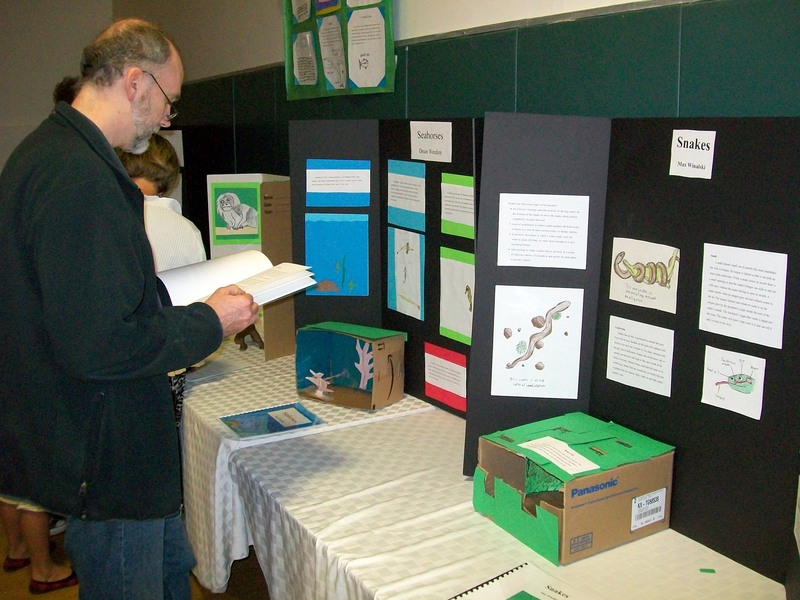 Following that inspiration, all the students had chosen animals to study, and visited nearby locations where they could observe first-hand the behaviors about which they were reading. Then they’d written about it all in reports organized and bound as books. 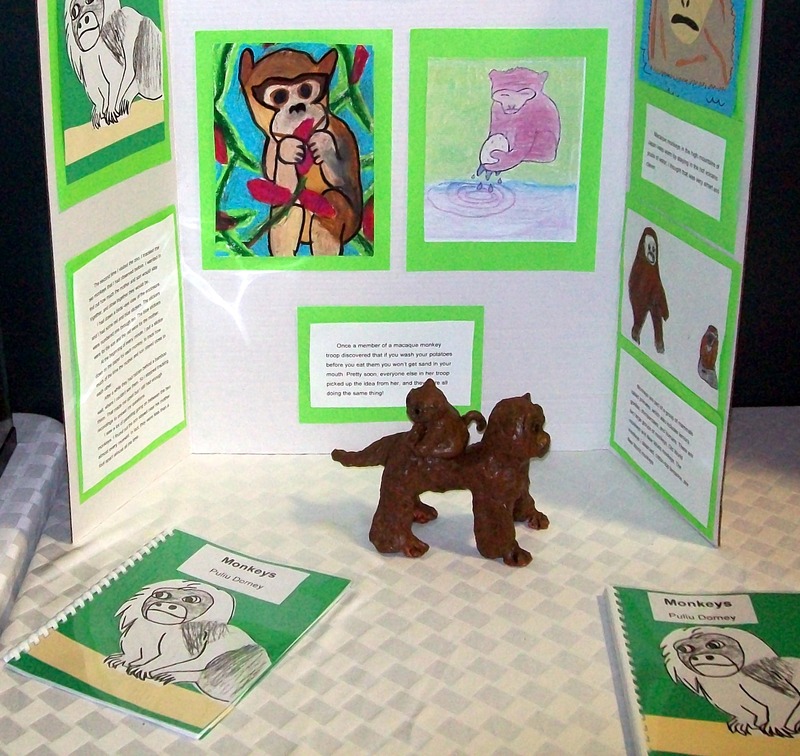 Each student’s Mimi Night display consisted of two copies of the bound report, a 3D object made to illustrate some behavior they’d observed, and a poster using material from the report to provide a quick overview. 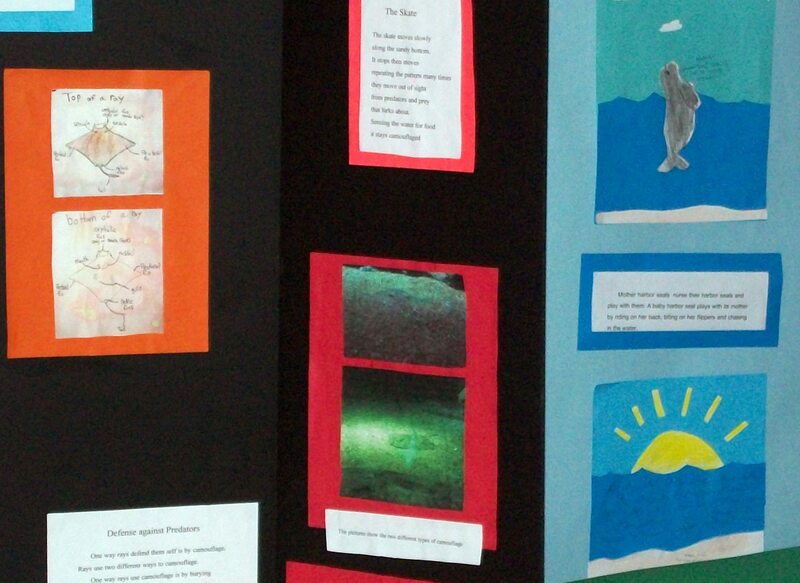 For their posters, students selected illustrations from those they’d created for their reports. 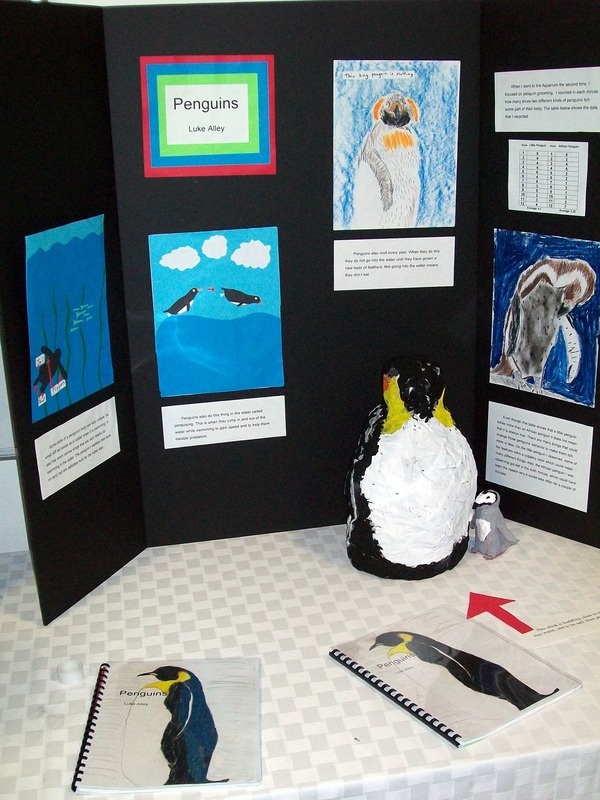 All the illustrations and 3D objects were created by the students themselves. Kids could use the illustrations in published books for inspiration. They could use photographs they or their parents had taken–but not photographs from magazines or online sources. Of course, some found this more difficult than others, and received extra support from teachers and classmates. Students explored a variety of illustration techniques including drawing, watercolor, cut-paper collage, and photographs. 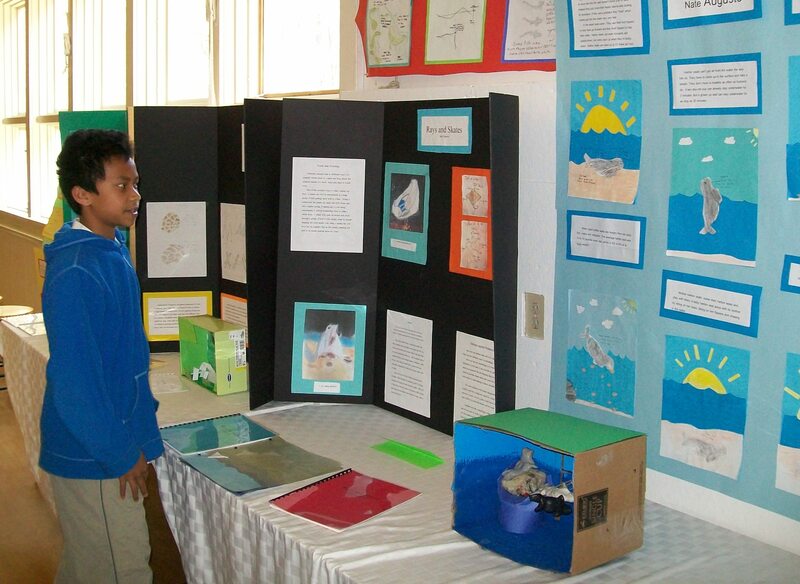 The classroom collection of previous years’ reports gave kids ideas and helped them set realistic goals. We weren’t looking for what adult artists could do–we were looking for the real and true and informative illustrations they could make, as kid artists who had spent a lot of time observing and studying their subject animals. 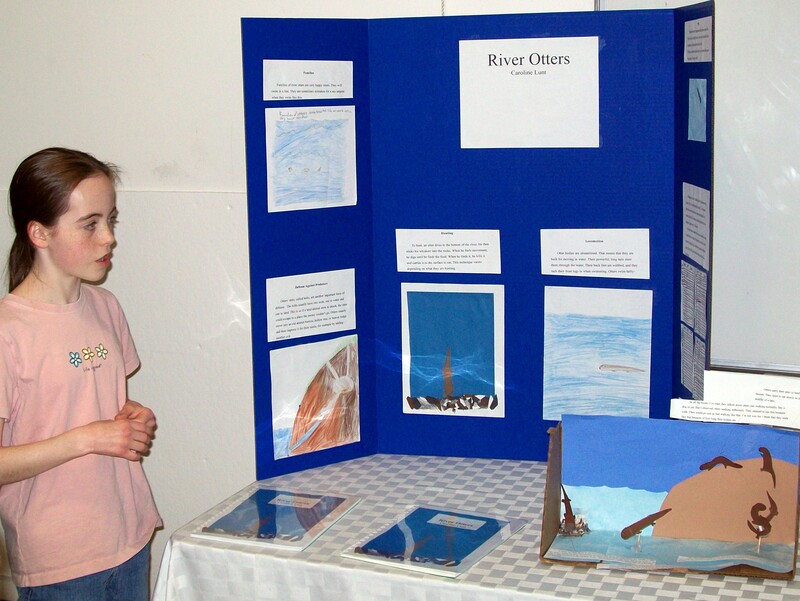 Some students made dioramas, small 3D scenes showing animals engaged in typical behaviors, like the one below showing river otters. Although Caroline is standing next to her display in the photo above, at Mimi Night the displays were meant to stand on their own, without live explanations–so that students could move around the room along with our visitors. Students, friends, and old-enough siblings, all used a class list page to take notes, writing down something learned from each report. Year after year, parents and grandparents won my everlasting gratitude by responding to the achievements and contributions of the whole class–not just their own kids. 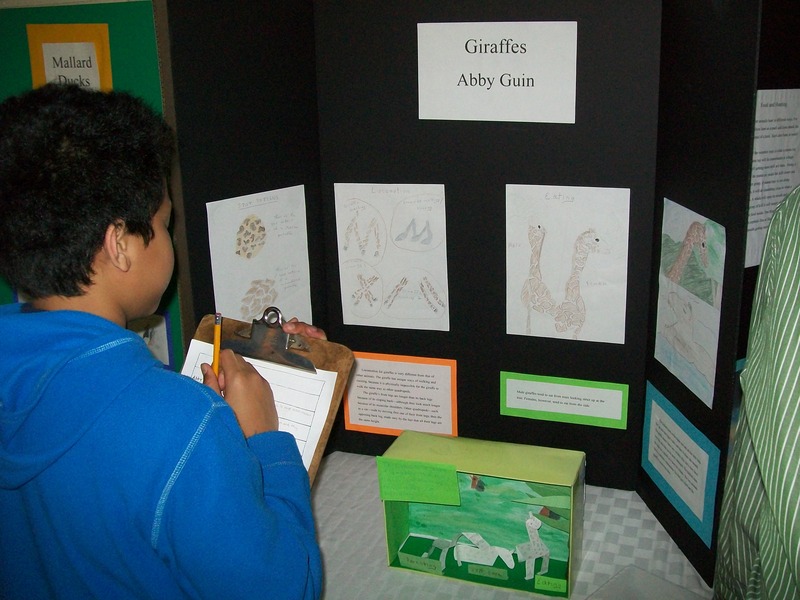 This helped students feel that they were the local experts on these animal species, and that their reports had real purpose. Of course, some adult schmoozing happened, too. 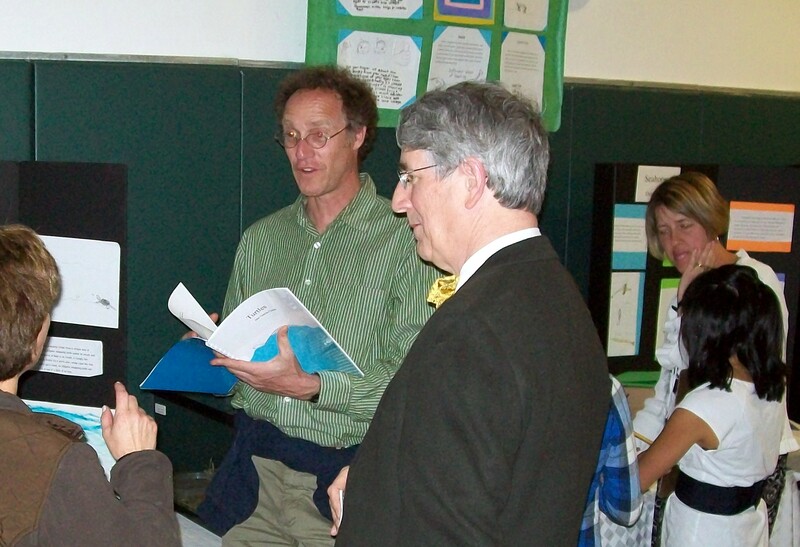 To the right, that year’s Head of School chats with two parents. In the background, another parent talks with one of her son’s classmates. 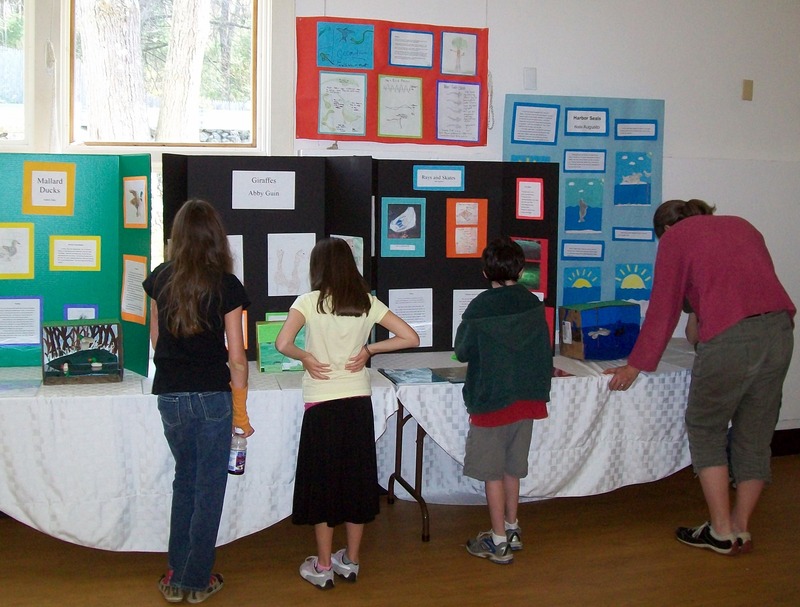 Some years–including this one–small groups of students thought together about types of behavior particularly important or interesting for the species they studied, and made group posters. 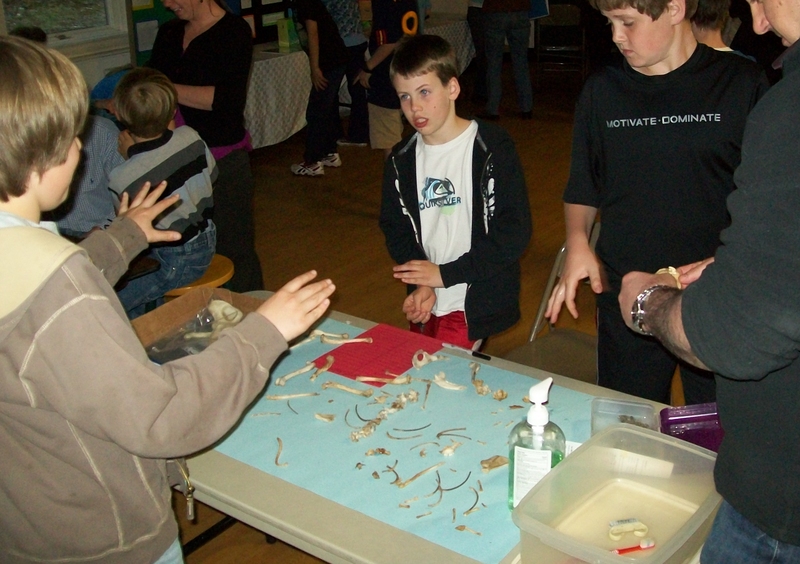 Here, for example, a group focused on behaviors making use of various senses, such as sight or taste. 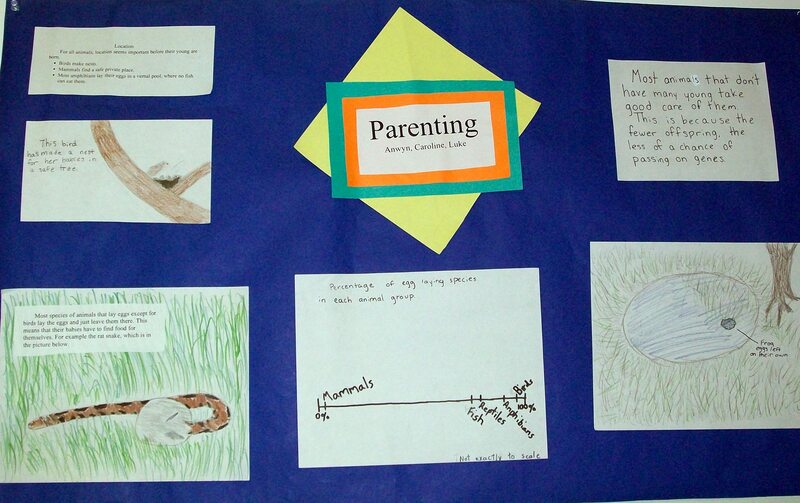 Another group thought about the tremendous variation in parenting behaviors (or their absence) among the various vertebrate classes. 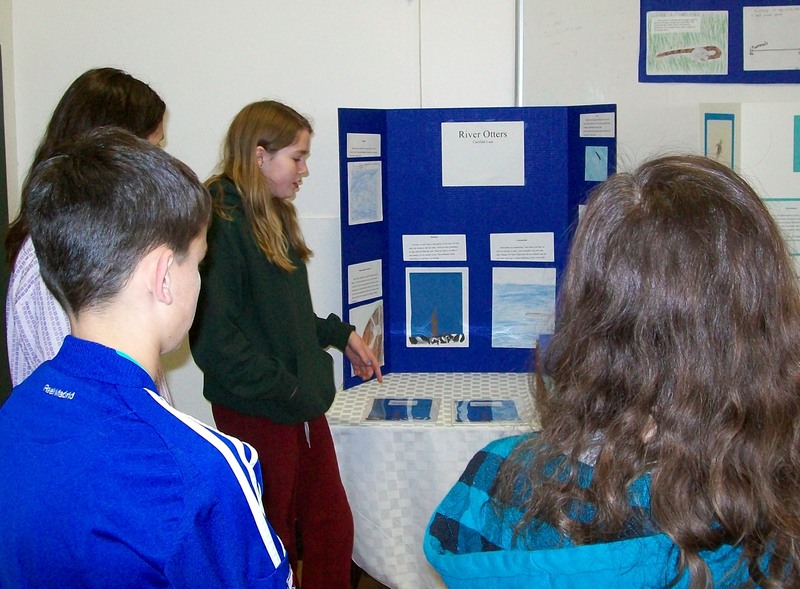 Each group’s individual displays were clustered together, and the group poster was hung above them. A few years before, a parent had given us a set of bones found on the school property, which she had boiled and scrubbed to make them safe as a sort of skeleton puzzle. That led to animated arguments about form, function, and just what critter the bones had once supported. The day after Mimi Night we opened up the Mimi Museum. Other classes came to visit, and parents from other classes were welcome to stroll through. Above, Anwyn serves as her group’s tour guide for visitors from the Older Student Program. She’s describing Caroline’s report, pointing to the illustration on the cover of the report itself. Below, Nate has worked his way across his group’s cluster, and he’s about to tell about his own display. 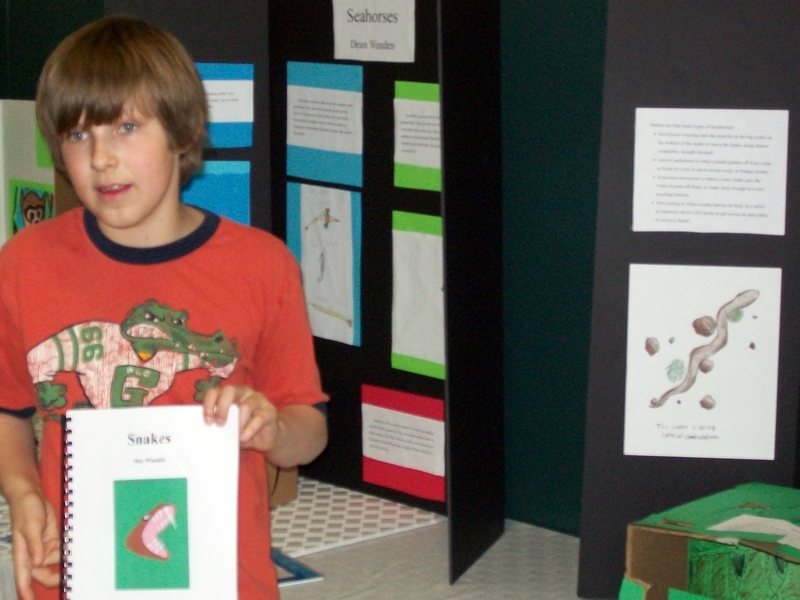 I love this photograph of Max holding up one of the copies of his report, with one of his illustrations of snake locomotion also visible, on the poster. The magic consists of kids paying attention to both the content–the wonder of the world–and to each other. 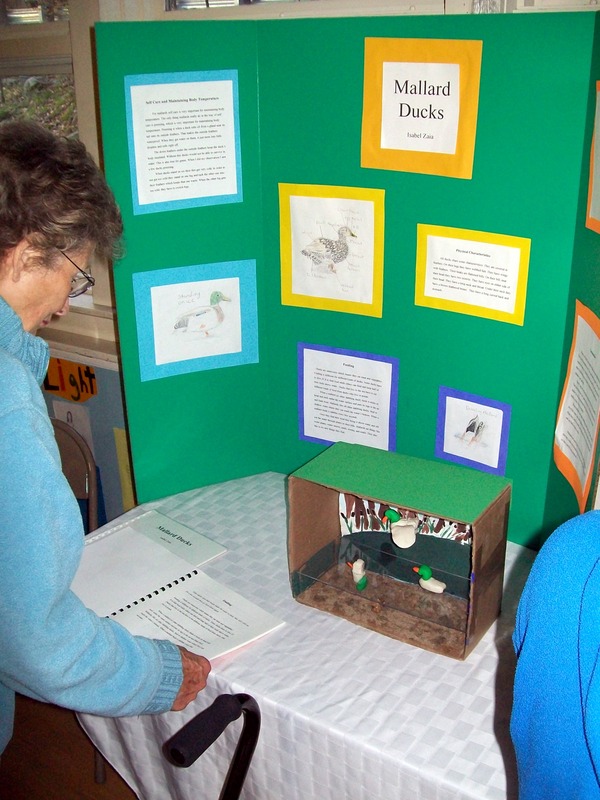 In portfolio conferences, when a student and her parents and I are all looking at a year’s work together, students often hold up their Mimi reports. Their parents have seen the reports already, of course; kids know that. Still they want to focus our attention on that work again. I’m always delighted as kids point to things they’ve gotten help with from others: “Emily (the arts teacher) helped me make the drum again a different way,” or “When we made the timeline with Kate, I realized how long ago this was,” or “Joe (a partner) helped me figure out a way to draw a harbor seal.” The physical copy of the report has become, itself, an artifact: a vessel that holds the memory of many shared meanings. Aside from the memories of specific kids and their work, the photos trigger several things for me. For one thing, I’m grateful for all the ways my own intellectual life has been nourished by the learning I did in order to keep up with my students, and the things they themselves taught me. Meanwhile, though, they were all giving me an immersion learning experience about what can happen in a classroom when the learning is purposeful and real and unbound from testing or grading. In fact, my convictions about what can happen in a classroom were largely shaped by what happened when we were voyaging on the Mimi, and then taking our own individual voyages into the world and each others’ learning, through the Mimi reports. 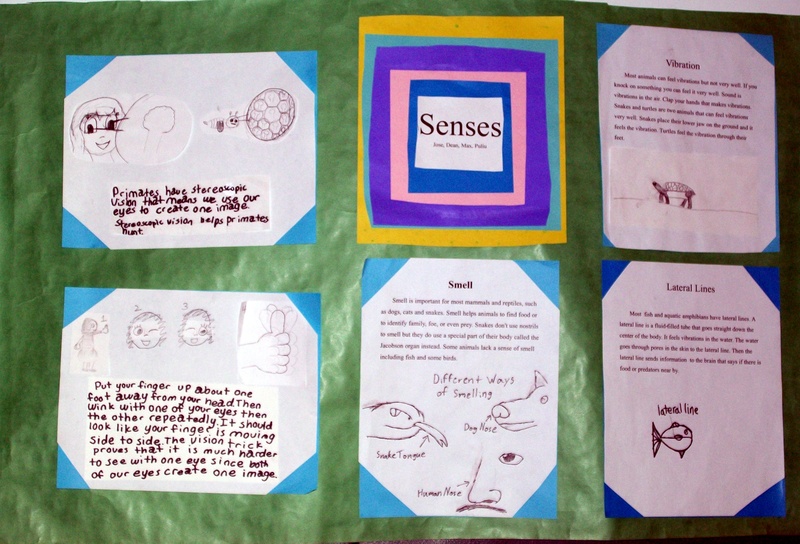 This entry was posted in Class life, Experiments, Fieldwork, Reading and writing, Science, Technology and tagged combining book learning and first-hand observation, Mimi Museum, research reports, teaching, The Second Voyage of the Mimi, The Voyage of the Mimi, Touchstone Community School, writing reports by pollybrown2013. Bookmark the permalink.